Imagine a plant that’s sensitive to its surroundings and responds accordingly. Sound like science fiction? It’s not! In fact, the plant’s ability to monitor its surroundings—and change its growth patterns in response—is essential to its health and success. When conditions become unfavorable, plants cannot simply get up and move like we can. So the Creator God designed plants with the amazing ability to monitor their surroundings and respond appropriately. We call this involuntary movement a tropism. Plants have the marvelous ability to bend or redirect growth either toward a stimulus (a positive tropism) or away from it (a negative tropism). Plants direct their growth in response to several external conditions, but the three most common are gravity, sunlight, and touch. Geotropism, also known as gravitropism, is a response to the earth’s gravity. When a seed begins to grow, the roots need to grow downward toward gravity, while the shoots need to grow upward away from gravity. Special cells in the tips of roots (called statocytes) are able to sense gravity. How is this done? Small structures inside these cells (called statoliths) sink to the downward side of the cell, much as a stone sinks to the bottom of a pool. The statocytes detect where these structures have sunk and use them to determine up from down. Then these specialized cells generate signals that are communicated to the rest of the root cells, allowing the root to grow in the direction of gravity. Similar structures appear in the shoots, but with the opposite response. The shoots grow upward toward the soil surface, away from the force of the earth’s gravity. Phototropism is a response to light. Most of us have noticed that a houseplant placed near a window will turn its stems and leaves toward the window. If the plant is turned around, it will bend back to face the window again, usually within a few hours. How does this happen? In the 1920s Dutch botanist Frits W. Went (1903–1990) discovered the cause, a hormone, which he called auxin, that causes plant growth. When light comes from only one direction, this hormone spreads unevenly in the plant and causes it to grow faster on the darker side. This differing growth rate causes the plant to turn toward the source of the light. Many vines, such as morning glories and sweet peas, show thigmotropism, a response to touch. In many of these plants, a special leaf called a tendril is designed to wrap itself around objects it contacts. When a tendril touches a fence post or similar object, it produces auxin, which is sent to other cells that have not touched the object. These cells then grow faster than the cells in contact, causing the tendril to curl around the object. The tendrils then use the object to support the plant and allow it to climb. Many roots also demonstrate a type of negative thigmotropism. They use a similar process to grow away from objects they touch in the soil. God’s wondrous design is evident throughout His creation. He designed a variety of plants to anchor themselves in the soil for nutrition; to cling to other objects for support; and to turn toward the sun for life-sustaining light. Likewise, He created mankind to be anchored in His Word for spiritual nutrition; to cling to the cross; and to turn toward the Son, the Light of the World and only source of eternal life. Unlike plants, which have no choice in how they grow, we must choose whether we will turn to Jesus and the Bible, or turn away. There are several easy-to-do-at-home experiments that allow you to observe plant tropism. This one displays geotropism (response to gravity). STEP 1 Cut the paper towel or blotting paper so it fits inside the CD case. STEP 2 Evenly place 4–5 dried lima beans on top of the paper towel. Turn each bean in a different direction. STEP 3 Moisten the paper towel. 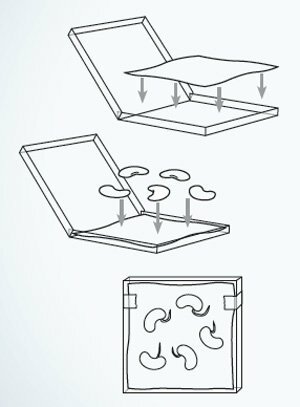 Close the CD case so that the beans are held snugly—but not crushed against the sides of the case. Tape the case shut. STEP 4 Set the CD case in an upright position. Keep the paper towel moist but not soaked until the beans begin to sprout. STEP 5 As the seeds begin to sprout, note the direction in which the roots and stems are growing. Does the direction the seed is turned affect the direction of growth? STEP 6 A couple of days after the seeds have begun to grow, rotate the CD case 90° on its side. After a few more days, note whether the direction of growth has changed. Rich Wendling, an Answers in Genesis-USA employee, is currently earning his masters degree in theological studies from Liberty University (Virginia). For thirteen years, he taught science, social studies, and math in public schools. Continual attacks on God’s Word can cause even Christians to question the Bible. 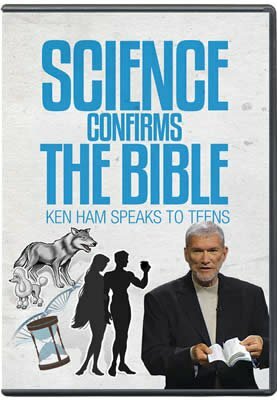 Are you prepared to answer the attacks, or more important, questions from those who honestly want to learn how we know God’s Word is true? 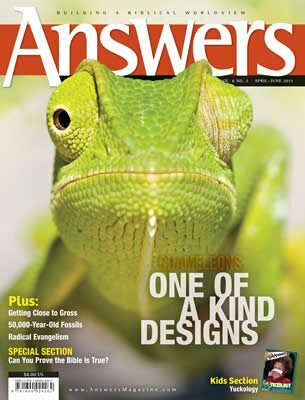 This issue of Answers will burrow down to the heart of the matter, highlighting seven reasons we know the Bible is true!